Abbas Akhavan, Beacon, 2012. Installation view with (from left) Envelope 2012, Mortar 2012, and Like a Bat Afraid of its Own Shadow 2012. Courtesy: the artist, Darling Foundry and the Third Line. Photo: Josée Pedneault. Abbas Akhavan’s installation Beacon transforms the cavernous Darling Foundry into a slowly breathing, giant organism (March 15 to May 27, 2012). 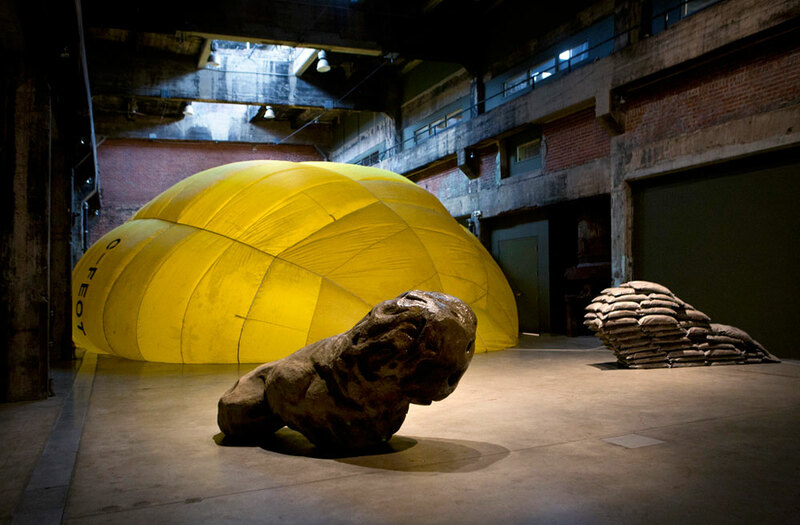 Lying prone on the floor is an undulating yellow “envelope,” a hot-air balloon alternately inflating to press itself against the brick walls, and deflating to form a flaccid pool of color. It rises up with a promise only to be cut off of its air supply and fall down to the floor repeatedly (Envelope, 2012). This yellow sun of sorts is guarded by a pair of sculptural gate-keepers, two lions, albeit at the edge of life themselves. One is a mixed-media replica of the partly demolished and deeply symbolic Stone Lion of Hamadan (Mortar, 2012). Hamadan, which dates back to the 7th century BCE, was conquered repeatedly and in 931 CE the ruling dynasty ordered the destruction of the lion gates. They were dethroned and dismembered. In 1949 one of the ruins was raised again but there is no trace of the counterpart it was thought to once have. Akhavan transports the lion to Montreal by way of mimesis and reunites it with its lost sibling, here figured as a stack of sand bags (Like a bat afraid of its own shadow, 2012). While the former is sensuous and inviting of touch, with a supple spine, wavy mane, and numerous fist-sized dells made from centuries of ritual use, the latter is obstructive, like a barricade or gun shelter. They look in opposite directions as though their clocks were out of synch. The two sculptures, together with the rising and falling envelope of air, establish a strong visual relationship. Beacon brings to mind cycles of destruction and perseverance, war, nature, Mars and Eros. These layers of meaning are intrinsic to the work, deftly embedded by Akhavan’s choice of material. Yet they seem tangential, as though an attempt at diegesis would compromise the physical empathy the installation elicits, the melancholic sense of its efforted breath and tired organs in states of decay and atrophy. “I have an iconoclastic relationship to making work. I don’t like creating new images or figuration,” states Akhavan, who would like his artwork to be experienced as though it were just happened upon unexpectedly. Its definition, operation and economy as “art” is subsequent to its discovery in the world of things among other things. When situated outdoors, this interpretive delay is easier to initiate, as in the audio recording of the bird songs Akhavan played outside the Vancouver Art Gallery (Landscape: For the Birds, 2009). But even within the context of a gallery, Akhavan succeeds in slowing down the influx of interpretive tools by deliberately withholding a clear message. This momentary pause in the process of signification allows the material reality of the installation to appear like a semiotically unmanageable monstrosity. The distinction that Gérard Genette makes between an artwork’s immanence (its physical presence) and its transcendence (the experience it induces) is useful when thinking through Akhavan’s installation. Like the stone lion of Hamadan, the usage and symbolic value of which varied with every new conquest since Alexander the Great, an artwork’s significance is mutable – it exceeds its immanence over time and space, through displacement, replication and adaptation, for example. This “excess” is the “work” that an artwork accomplishes and cannot be separated from it. In the case of Beacon, it is as if the immanent and transcendent parts of the artwork operate in tandem, rendering the installation mute, then almost magical, battered and broken, and then heroic. On the roof of the foundry Akhavan installed a large plywood stencil that casts a legible shadow on the facing brick wall at sunset (6:58/8:32, 2012). It reads “second nature.” Herein lay all the dualities Beacon mobilizes: rise/fall, absence/presence, nature/culture, original/copy, empty/full, immanence/transcendence. This entry was posted in Exhibition Reviews and tagged Abbas Akhavan, Art Papers, contemporary art, Darling Foundary, exhibition review, installation, Montreal, sculpture. Bookmark the permalink.